Duct Straps | Plastic Zip Tie Duct Straps | Cal Fasteners, Inc.
Cal Fasteners stocks extra long, extra heavy duty plastic zip tie duct straps. Special designs make installation faster and easier, with low insertion and low pull through force required. Angled tails provide quicker initial insertion alignment, and tail finger grips allow for easier handling and tightening. One-piece design and durable nylon materials provide high tensile strength (175 lbs.). Advanced pawl and teeth designs give these duct straps superior holding strength. Rounded edges provide added safety and eliminate insulation damage. Manufactured from natural and UV-treated black filtered nylon 6/6. ROHS compliant. UL listed. 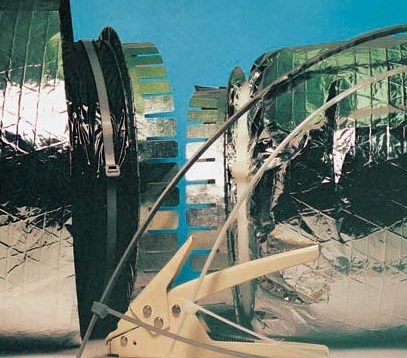 Request a quote on duct straps for your project, or contact Cal Fasteners to learn more.